Regular excercise like walking, running, cycling or swimming help to keep blood vessels healthy which helps reduce varicose veins. Dr. Whiddon of Dallas Vein Specialists focuses on disorders and diseases of the veins with special emphasis on vein problems of the lower extremities – problems like varicose veins, spider veins, venous leg ulcers, prominent eye veins and more. Diagnostic and treatment measures are performed in office using state-of-the-art equipment and techniques, including Sclerotherapy, Laser Vein Removal (EVLT), Microphlebectomy (Ambulatory Phlebectomy) and Ultrasound-guided therapy. The emphasis at Dallas Vein Specialists is to obtain the best outcome with minimal or no pain and discomfort and to ensure a quick return to normal activities. Dr. Whiddon’s emphasis is always on achieving the best aesthetic results for his patients. CLaCS results in better aesthetic appearance of the legs with more permanent results. Dallas Vein Specialists is the first to offer this remarkable procedure. What to do about veins that bulge or cause dark lines beneath or along side the eyes (on the temples)? Now there is a safe and effective treatment that will eliminate these unsightly veins without surgery or injections of chemicals. At Dallas Vein Specialists we offer the best and safest treatment using a transdermal laser that targets only the vein leaving no skin damage. Over 2 to 4 treatments, usually performed 1-2 weeks apart, the vein or veins gradually diminish in size and finally are totally eliminated. Our results and patient satisfaction are excellent. 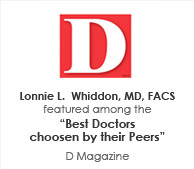 Dr. Whiddon among D Magazine's 2013 "Best Doctors"
Dr. Whiddon has been named as one of D Magazine’s BEST DOCTORS in Vascular Surgery for 2013. D Magazine asked 8,835 local doctors to vote for up to 3 doctors in 43 categories. They are asked to vote for doctors considering the following question: “Which Dallas doctors would you trust with the care of a loved one?” Doctors cannot pay to be listed. Watch the CBS Channel 11 news segment on varicose veins that aired August 2, 2012. The news crew visited Dallas Vein Specialists and interviewed a varicose vein patient. The patient’s CoolTouch laser ablation procedure was filmed as performed by Dr. Whiddon. 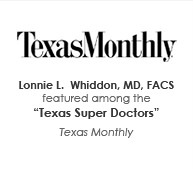 Dr. Whiddon was recently interviewed for a Health and Fitness website for Women. Read the full article on Varicose veins at Shannon Miller Lifestyle. Spider Veins and Venacura – Does it Work?